(Book Five in the New Edition of the collected Love and Rockets) Wow! 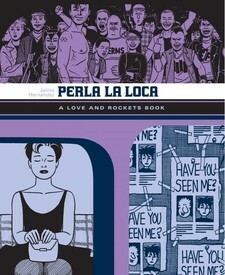 Fantagraphics isn't wasting any time in getting out the newly formatted editions collecting that classic among classics, the original first volume of Love and Rockets by Los Bros Hernandez. The unrelenting greatness continues with Perla la Loca presenting "Wig Wam Bam" and "Chester Square" along with a handful of minor gems, all by the one and only Xaime. Beyond Palomar contains all the twists and turns of "Poison River," perhaps the most complex of Gilbert's epics, along with his L.A.-centered "Love and Rockets X." There's not much more that can be said about these comics other than, "READ THEM!" It really doesn't get any better than this.